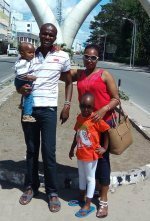 Nyali beach is immediately north of Mombasa Island in the lovely posh neighborhood of Nyali. You'd hardly expect to find a well hidden oasis of tranquility such as Nyali Beach right next to the bustling city of Mombasa; that you do is one of life's lovely surprises. Nyali borders Tudor creek in the South and Bamburi Beach in the north. 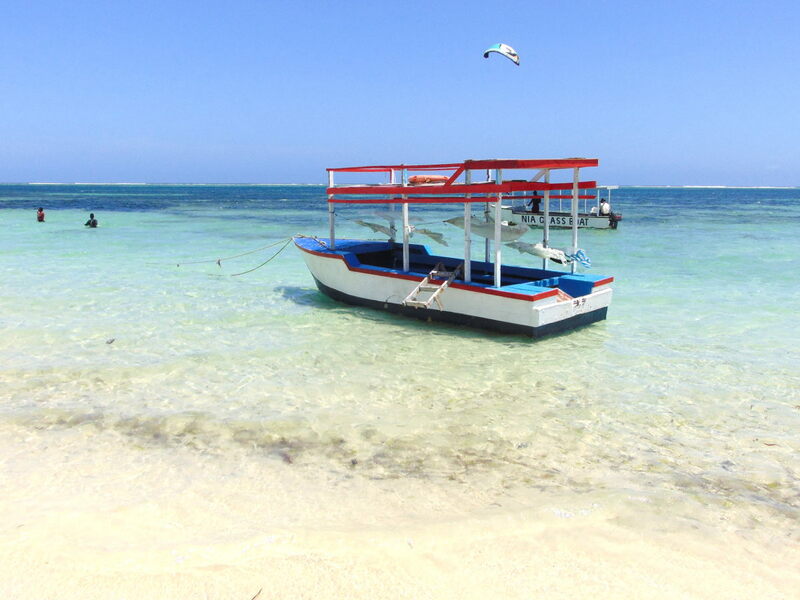 This beach is truly stunning: long and wide with glittering white soft sands, soothing sea breezes and amazing coral scenery - it is very well maintained and is always kept spotless. A place to enjoy some of the most beautiful views of the Indian Ocean that Africa has to offer. Lie back with something cool to drink and watch the dhows make their way to and from the nearby old port. A little farther away big ships enter and leave the main Kenyan harbor of Mombasa. Most people and families love this beach for picnics and beach outings - its romantic natural setting, with its backdrop of tropical palm trees and rocky cliffs, make it perfect for a day at the beach. Kids love it for the great sand (perfect for sandcastles), calm and shallow sea and the thrill of running after the cute and harmless little ghost crabs (which inhabit most of the beach). 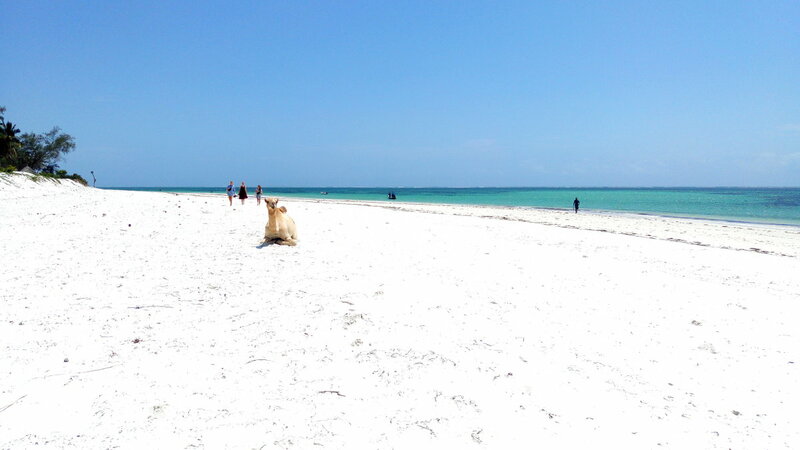 Nyali Beach lies within Mombasa Marine Park Reserve and bustles with activities on summer weekends. On weekdays, you can easily find plenty of spots to relax and enjoy the serene beach. 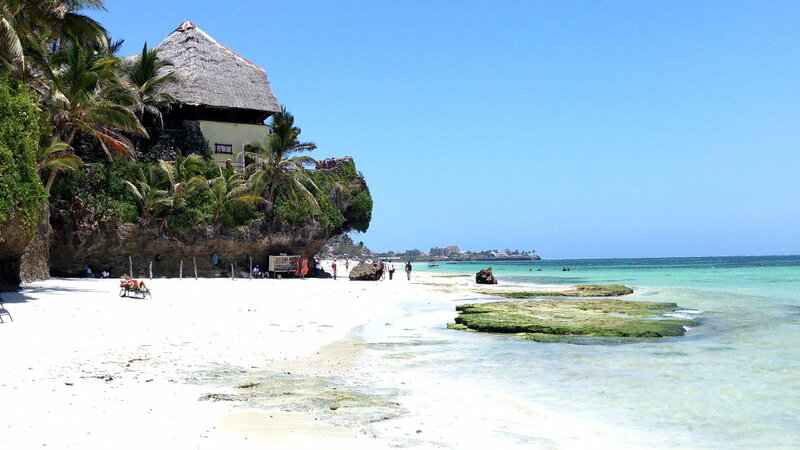 The upper side of Nyali beach is Mombasa Beach, which is the most visited side. The two beaches are only separated by a medium sized coral rock. During high tides, crossing to either side is difficult and risky - even if you are a very good swimmer. But at low tide, the rocky coral is beautiful to explore. There are a few beach boys and vendors at the beach selling beautiful African fabrics and artifacts. 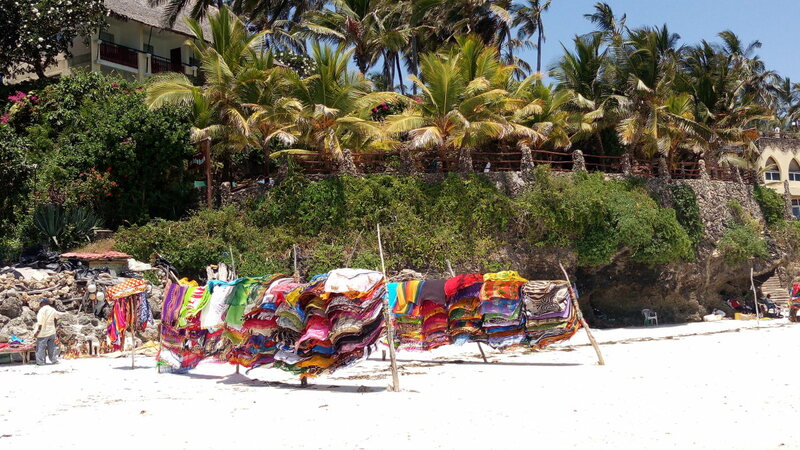 Unlike on some other beaches, on Nyali Beach their numbers are strictly controlled and they really do sell some fabulous items. Bargain with them and you'll likely pickup a memorable souvenir of your time in my country for a great price. If you wish, you can book your snorkeling safaris or water sport activities with the beach boys, it's a much cheaper option than booking with your hotel or via your tour operator. Get to know them, they are very friendly and humble. The coral reef creates calm shallow seas and the prevailing breezes create the perfect conditions for beginner and intermediate level kite-surfers. Scuba diving, jet skiing, sailing and other water sports activities are also available. The ocean here is of course tidal so watch out for high tides… they can be dangerous to swim in and can block your way along the shore from one part of the beach to another. There are several top notch hotels located within walking distance of each other. Such as the Voyager Beach Resort, the Bahari Beach Hotel, the Mombasa Beach Hotel, the Reef Hotel Mombasa and the Nyali Sun Africa Beach Hotel & Spa. The Bahari is the one I particularly love - the location is perfect! The way it blends in with the rocks and palm trees is an example to be followed in terms of unobtrusive design. Most hotels offer excellent dining choices, ranging from Italian to traditional coastal dishes but please don't leave Kenya until you've tried some of the fabulous local seafood dishes - absolutely unforgettable! The very best restaurant for seafood is the Tamarind Restaurant- Mombasa. Access to the beach is either through the private hotels and villas or via the public pathways of which there are quite few. 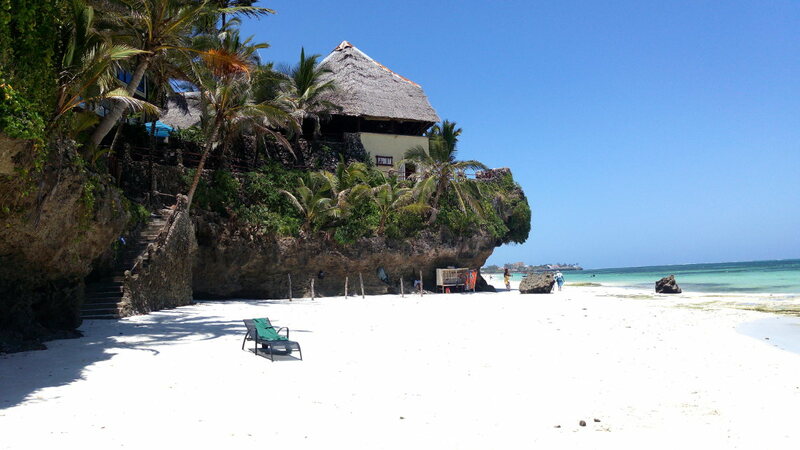 The beach is within 10 minute driving from Mombasa city. If you don't have your own car then, to get to the beach from town, board Nyali-Reef ‘Matatu’ from the CBD or get a tuk-tuk taxi to take you to your exact spot. Camels will gladly transport you up and down the beach - for a small fee of course. The beach is in the affluent leafy suburb of Nyali, with modern shopping malls, a cinema complex (Nyali Cinemax), financial services and other interesting scenic sites like Mamba Village (The biggest croc farm in Africa), Nyali Golf Club and the Dwarikadham Hindu temple all nearby.